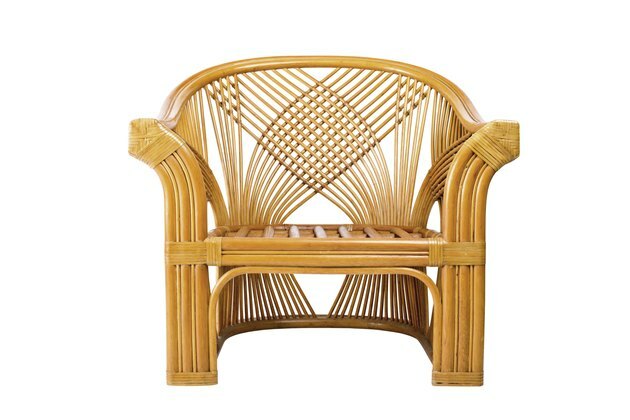 The terms wicker and rattan are terms referring to categories of casual furniture, which are sometimes confused. However, rattan is a particular natural material, while wicker describes a technique for weaving fibers, natural or man-made, into functional shapes. Rattan "peels" taken from the skin of the rattan vine may be woven into wicker shapes or used in caning, which helps explain how closely the terms are related and the resulting confusion. A natural rattan chair with a wicker back glows in a warm caramel tone. A jungle vine, rattan is indigenous to tropical areas of Southeast Asia, Africa and Australasia. A member of the palm family, its most distinctive property is exceptional strength caused by a solid core of vertical fibers. Rattan poles grow to more than 100 feet in length; they are harvested and cut into lengths of 15 to 18 feet. An outer "peel" encases the core. The peel separates into strands that can be woven or bound to support solid elements in a piece of furniture. Lengths of rattan vine maintain a consistent diameter, making it ideal for furniture construction. The vine is harvested in the jungle and cut into 12- to 15-foot lengths. In the processing area, the poles or canes are stripped of leaves and fumigated to remove contaminants. After drying, each cane is mechanically extruded to remove its peel. Furniture manufacturers bend rattan poles after steaming, making possible an array of attractive shapes. When dry, the curved canes are nearly indestructible. The rattan vine comes in a variety of natural colors, ranging from straw to caramel, and can also be painted, sometimes in a pattern to resemble bamboo, producing "faux bamboo." Weaving natural materials such as rushes, reeds, rattan, willow and sea grass into wicker is an ancient craft dating to B.C.E. in Egypt. Contemporary manufacturers use traditional materials and techniques, but they also weave with recycled materials such as rolled paper or resin to produce all-weather furniture suitable for indoor or outdoor use. The highest quality furniture is still woven by hand on a frame constructed of cast or extruded aluminum or rattan. The materials used for wicker furniture are flexible, allowing for bends without cracking or splintering. Wicker produced with quality materials and fine craftsmanship is quite durable. Manufacturers produce wicker furniture in a wide array of designs, ranging from ornate Victorian cottage styles to sleek, contemporary deep seating. While rattan furniture has a singular appearance, wicker styling has many looks. Wicker woven with resin doesn't need painting; natural fibers may be left naked, finished in natural colors or painted in any desired color. Rattan furniture fades in sunlight, making it less desirable for outdoor use; however, it is highly favored for porches and sunrooms, where it evokes a retro elegance and exotic appeal. Wicker woven with traditional materials including tightly rolled paper strands, is less durable than rattan, but it doesn't fade in sunlight. Wicker woven with resin is completely weather-proof and is appropriate for indoor or outdoor installations. Is a Banana Plant a Herb, Shrub or Tree?